1. RENTAL: The Guest agrees to rent from the Owner and the Owner agrees to lease to the Guest the Property. 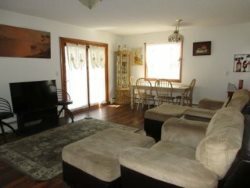 Owner and Guest understand and agree that the Property is a vacation rental. The Guest is a transient guest or seasonal Guest. The New Jersey Anti-Eviction Act does not apply to this rental. This Lease is valid only when accepted by the Owner via signature, and may be terminated by the Owner upon default of any payments or other obligations of the Guest, as outlined in this Rental Agreement. 2. OCCUPANCY/USE/CARE OF PROPERTY: The maximum number of persons allowed to occupy Property, including children, is indicated on the Confirmation/Signature page. The Guest shall take possession of and use the Property only as a private residence for no more than the maximum number of persons. The Guest shall not allow the Property to be used for any business, professional or unlawful purposes. House trailers and recreational vehicles are not permitted on the Property. There shall be no alterations to the Property and no fixtures, appliances or air conditioners shall be installed without written consent of the Owner. The Guest affirms that he/she is over twenty-four (24) years of age and minors will not occupy the Property unless an adult is present. It is the policy of Keller Williams Realty Jersey Shore to rent (1) to family groups only, or (2) to non-family groups wherein at least two Guests signing the Rental Agreement are 24 years of age or older and will supervise and be responsible for members of the group that are under 24 years of age. A family is defined as parents, grandparents, children and extended family members vacationing in one property. A non-family group is defined as unrelated adults, high school students, college students or any other type of a situation not meeting the age requirement stipulated herein. Should Keller Williams Realty Jersey Shore personnel ascertain a non-family group occupying a property in violation of the age requirement; the group is subject to immediate termination of the Rental Agreement with no refund. Keller Williams Realty Jersey Shore reserves the right to refuse rental, cancel existing reservations and terminate occupancy without refund if the occupancy, in our opinion, is detrimental to the rental property and its owner, whom we represent, without refund. Unreasonable noise or disturbance by the Guest may result in eviction. Guest agrees to return premises to Owner on expiration date of Lease in as clean and good condition as reasonable use will permit and to repair, replace or pay for any breakage or damage to the Property, furnishings and equipment. Guest is only responsible for breakage or damage done by Guest and/or their guests. SMOKING IS NOT PERMITTED! 3. ACCEPTANCE OF PROPERTY: Opinions as to the condition of the Property vary from individual and are very subjective. If the Guest has not personally viewed or inspected the Property, the Guest shall not rely on any opinion expressed by a third party, including the Rental Agent, Owner, Website or Owner Website. The Guest bears sole risk of renting the Property SIGHT UNSEEN and in not being satisfied with the condition of the Property at the time of check-in. IT IS HIGHLY RECOMMENDED THAT THE GUEST PERSONALLY VIEW THE PROPERTY BEFORE SIGNING THE RENTAL AGREEMENT. THE PROPERTY IS BEING RENTED “AS IS”. 4. NON-LIABILITY OF THE REALTOR: The Owner and the Guest understand and agree that Keller Williams Realty Jersey Shore and their agents are not Property Managers or Rental Managers for the Property. The Agents are acting merely as Rental Agents in this Rental Agreement transaction. The Agents shall not be liable for any claims, demands, damages or costs in any manner relating to either alleged defects or problems with the Property or to any other circumstances surrounding the rental. In the event Keller Williams Realty Jersey Shore has made a payment to the Owner which the Guest withdraws or otherwise cancels such that Keller Williams Realty Jersey Shore never receives the funds, the Owner agrees to reimburse Keller Williams Realty Jersey Shore for any such funds. Guest understands that all Guest payments are the property of Owner with exception of the commission, admin fee and SDPP. Keller Williams Realty Jersey Shore has no authority to return any Guest payment without the consent of the Owner. This agreement is entered into based upon the Guest’s independent knowledge of the Property or the representations specifically contained in the Rental Agreement and not on any representations made by the Owner or its agents. Keller Williams Realty Jersey Shore and their agents shall not in any event be held liable to the Owner. 5. SUGGESTED ITEMS TO BRING: The Owners do not provide: sheets, pillow cases, pool/beach towels, bath towels, laundry detergent, dish detergent, paper products of any kind, beach supplies, bikes and personal items unless otherwise noted in the “Detail” section of the Property on the website. The full list of amenities is found on each Property on the Keller Williams Realty Jersey Shore website, www.kwjerseyshorerentals.com though no warranties are given as to its accuracy. Appliances, air conditioning, and amenities are not guaranteed and refunds will not be given due to breakdown. Repairs will be made as soon as possible. (Please see paragraph 8 “Repairs”). 6. PARKING: Please be sure to comply with local ordinances and posted condo association rules and regulations. Keller Williams Realty Jersey Shore will not be responsible for parking tickets or towing expenses. Vehicles are not allowed in the parking spaces after check-out. If determined the Guest has their car parked at the property after termination of this Short Term Rental Agreement, Guest will automatically be charged $250.00 to the card on file and car will be towed at Guest’s expense. 7. WASTE/RECYCLE/TRASH: All of the municipalities recycle. Therefore the Guests are responsible to separate all trash according to the Property in which you are renting. Please follow all condo association rules and regulations. Recycling is mandated by the State of New Jersey and will be strictly enforced! The Guest will be responsible for any fines that are levied by the City to the Property during your specific rental period. 8. REPAIRS: Please report any necessary repairs to the Keller Williams Realty Jersey Shore office between the hours of 9:00 AM to 4:00 PM at 844-KWSHORE or email [email protected] Keller Williams Realty Jersey Shore is not responsible for any maintenance or repair of the Property and any such obligations or issues are solely responsibility of the Guest and Owner. 9. VISITATION PERMISSION: Upon reasonable notice the Owner or Agent shall have access to the Property to provide services, inspect and/or make any necessary repairs. In case of emergency or the Guest’s absence, the Owner or Agent may enter the Property without the Guest’s consent. 10. INSURANCE OF GUEST’S BELONGINGS: The Owner DOES NOT provide insurance covering loss to any of the Guest’s belongings. The Guest has total responsibility for securing protection against loss by fire or other cause to the Guest’s belongings. It is the responsibility of the Guest to make sure all valuable and personal items are removed upon checking-out of the property. Keller Williams Jersey Shore and Owner are not responsible for any items left behind in the Property. 11. SPECIFIC PERFORMANCE: Keller Williams Realty Jersey Shore is acting as a transaction agent only and does not warrant nor guarantee specific performance of any Rental Agreement. We reserve the right to decline offering a rental to anyone misrepresenting themselves in any fashion. At times due to reasons beyond ours or the Owner’s control but not limited to a double booking, death of an owner or foreclosure, a comparable unit may be offered a Guest. Realtors reserve the right to show the Property with adequate notice to the renting family if the unit is listed for sale. 1. Upon arrival at the contracted Property at the contracted time, as described in this rental agreement, the said Property is considered by myself and Keller Williams Realty Jersey Shore to be uninhabitable, or in conditions extensively variant from those advertised; whereas Keller Williams Realty Jersey Shore is given notice , in writing, of such conditions within 24 hours of arrival at said Property; whereas the situation is unable to be rectified to the standards advertised and set forth in this rental agreement after Keller Williams Realty Jersey Shore has made every reasonable effort to correct and/or provide compensation for such conditions. 2. The transaction(s) by which said monies were prepaid to Keller Williams Realty Jersey Shore are found to have been made fraudulently. 13. KEYS: All keys given and held by the Guest are to be returned to Keller Williams Realty Jersey Shore at the termination of this rental agreement. There is a $25 charge for each set of keys, fobs, or swipes not returned and/or lost. This will automatically be charged to the credit card on file. By acknowledging this rental agreement you permit Keller Williams Realty Jersey Shore to charge up to $100.00 for a lock change and/or replacement keys. 14. CHECK-OUT: Prior to 10:00 AM on scheduled departure date. When checking-out Guests must be mindful of the next family and be sure the following items are completed. 2. All trash and recyclables must be placed in their proper receptacles and set curbside on appropriate date. 3. All utensils and dishes utilized must be washed and placed away where they were found. 4. General cleaning of each unit must be completed. Each unit must be left in a neat and tidy condition and in the condition you found upon check in. 5. All keys must be returned to the Keller Williams Realty Jersey Shore office from which the Guest checked in. 15. CLEANING SERVICE: Prior to arrival each Property is cleaned. Daily Cleaning is not included. However, it is the obligation of the Guest to surrender the Property in good, clean condition by the time specified in the lease agreement. 16. SECURITY DEPOSIT PROTECTION PLAN / ACCIDENTAL DAMAGE PROTECTION (SDPP): TERMS: In lieu of a traditional Security Deposit Keller Williams Realty Jersey Shore offers an Accidental Damage Protection Agreement for Weekly Rentals. For a set fee of fifty nonrefundable dollars ($50.00) by accepting the terms of this rental agreement the Guest agrees that the Guest will not be held liable or accountable for any damage caused to the Property during their possession. Possession shall include common areas in case of a condominium or townhouse. It is the obligation of the Guest to surrender the property in good clean condition by the time specified in the Agreement; normal wear and tear is expected. In the event the damage caused is over and above the maximum payment of $1,000.00 the Guest agrees to pay for damage or be willfully sued by the Owner. Should Owner feel the need to report damage and receive compensation, the Owner must report the damage within 3 days of the departure date in writing to the Keller Williams Realty Jersey Shore Rental Office or the damage will not be covered under the terms of the Accidental Damage Protection Program. In addition, within 10 days of departure the Owner must send the Keller Williams Realty Jersey Shore Rental Office a list detailing the nature of the damage along with photos of the damage. Representatives of the Keller Williams Realty Jersey Shore Rental Department have the ultimate administrative authority to determine the scope of damages covered under the Protection. Once the Representatives have made a decision that compensation is owed to the Owner an original receipt of the replaced/fixed damaged Property must be given to the Keller Williams Realty Jersey Shore Rental Office in order to facilitate reimbursement. The Accidental Damage Protection is limited to a maximum payment amount of one thousand dollars ($1,000.00) per rental agreement. 1. Intentional acts of the Guest. 2. Negligence, impairment, willful, non-willful or wanton conduct or misconduct. 3. Theft of Owner’s items without a valid police report. 4. Damage caused by any pet or other animal brought to the premises by the Guest. 5. Theft or damage to any Property owned by a Guest. Protection is limited to Owner’s items only. 6. Property damage resulting from any motorized vehicle or watercraft operated by the Guest. 7. Damages related to glass table tops are excluded and will be the Guest’s responsibility. 8. Seasonal and Annual leases are exempt from this program. Should any of the above occur we reserve the right to file a claim against the Guest in Cape May Court House Small Claims Court. 1. The protection takes effect upon check-in per this rental agreement on the arrival date to a Keller Williams Realty Jersey Shore listed Property, together with receipt of full rental agreement payment. 2. The protection will become void if the Guest checks in prior to the 2:00PM check-in time specified on the rental agreement or should any term on this rental agreement be violated by the Guest. 3. All coverage shall terminate upon check-out per the terms of this rental agreement or the departure of the Guest, whichever occurs first. 1. Cleaning. Guest is responsible to clean the Property prior to check out. If the Property is returned without adhering to the check-out items listed in Item #14 of this agreement, Guest will incur a $350 cleaning fee that will automatically be charged to the card on file. Owner: Within 3 days of departure, we require immediate notification via phone or email of a pending security hold and the reason(s) for this hold. Within 10 days of departure an Owner must send to our attention via email detailing the nature of the security hold along with pictures. KWJS: Keller Williams Realty Jersey Shore will convey to the Guest this list in addition to the photos while acting as the intermediary between Owner and Guest in hopes of bringing the circumstance to a conclusion within the 30 days following the Guest’s departure. Guest: Guest will be expected to respond. If Guest does not respond within ten days, deposit will be forfeited to the Owner. All Parties: Should a circumstance not be remedied by each party within the 30 day period following a Guest’s departure date the security deposit will remain in escrow while the Owner decides the appropriate course of action up to and including filing a case in Cape May Court House Small Claim’s Court. 1. Failure to follow the above timelines by either party will result in normal release of the deposit. 2. Keller Williams Realty Jersey Shore can only assist in this process and will not be expected to provide legal advice. Keller Williams Realty Jersey Shore will not be held liable or accountable by either party for performing our stated policy of returning security deposits within 30 days of check out following a Guest’s departure date without a list detailing the need to continue to hold pending a remedy. Should either party feel the need for legal representation either party has the right to do so. Keller Williams Realty Jersey Shore is acting only as Agent and is not responsible for the acts of either Guest or Owner. By acceptance of the deposit with this lease, Owner agrees to pay Keller Williams Realty Jersey Shore a professional service fee for this lease or any further lease with this Guest with a 24 month period. 17. TRAVEL INSURANCE: Refunds will not be given for cancellations (see paragraph #18) or occupancy delays due to deaths in the family, medical emergencies, travel cancellations or delays, weather related events or evacuations, or other events that would be considered ACTS OF GOD or that are out of the control of the Owner. The Guest may purchase travel insurance through an independent insurance agency to cover these events. If the Guest decides not to purchase travel insurance, the Guest may be forfeiting their ability to receive a refund if any of the above events occur. Travel insurance is a way to protect your vacation investment and should be considered. 1. A request submitted via email at [email protected] This only notifies Keller Williams Realty Jersey Shore that the Guest has an interest in canceling reservation. 2. A mitigated refund amount will be offered if the unit is re-rented. 3. Refunds will be mitigated according to the following calculation method- Total Rental Amount less 100% Administrative Fee, less 100% Commission, less $50 SDPP, less $150.00 Processing Fee. 4. Refunds will be processed one week following the original confirmed rental dates being re-rented. 5. Refunds related to inclement weather or acts of God will not be accommodated. Again, the deposit will be returned ONLY if Keller Williams Realty Jersey Shore are able to re-rent the Property for the same period and rental amount. The administrative fees, SDPP and commissions are not refundable. 19. VIOLATION OF LEASE AGREEMENT: Upon violation of the following terms and conditions, specifically any occupancy limits, substantiated parking, noise and/or trash complaints the lease is subject to immediate revocation, and Guest is subject to immediate removal from the Property, a minimum $500 fine and cleaning fees will automatically be charged to the card on file. Additionally, Guest acknowledges that they may be subject to consequential damages as a result of their violation, including, without limitation, damages associated with Keller Williams Realty Jersey Shore.